Photo provided by Paul Tanner. The Manas Wildlife Sanctuary is located in the Himalayan foothills and known for its tiger and elephant populations. The park is densly forested. The Manas river a major tributary of the Brahmaputra. The fauna of the park includes Tigers, Elephants, Rhinoceros, Wild Buffaloes, Leopards, Clouded Leopards Black Panthers, Gaurs, Swamp Deer, Capped Langurs, Golden Langurs, Assamese Macaques, Slow Loris, Hoolock Gibbons, Smooth Indian Otters, Sloth Bears, Barking Deer, Hog Deer, Sambar and Chital. It is also well known for its rare and endangered wildlife which is not found anywhere else in the world like the Assam Roofed Turtle, Hispid Hare, Golden Langur and Pygmy Hog. In 1992, UNESCO declared it as a world heritage site in danger due to heavy poaching and terrorist activities. Have you ever wanted to go to Bhutan but were put off by the high fees (which aren't really that high if you think about it being all inclusive but anyway)? Well you can go to Bhutan for free! But there is a catch. 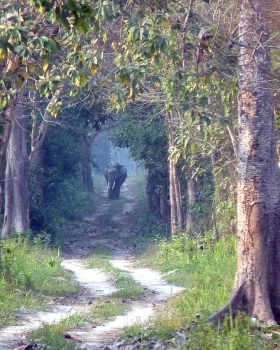 You need to a) go to India, b) visit Manas NP, and lastly c) ask/persuade your guide to take you across the border. The border is less than an hour from the park entrance near the park ranger quarters but there are no border guards, no passport checks, there is a small hut and an open gate so maybe it is used sometimes or it was used before. Okay for one this ain't Paro so you will not continue to the Tiger's Nest on this trip. Second you will not see much because the guide won't risk taking you far in. To get to Manas I took the train from NJP after returning from Darjeeling. It takes a good 6 hours but I find the 2AC beds adequate to nap and have enough space to feel luxurious. The Indian police also eradicated the peddlers a couple of times and it was quiet for a bit. Once you reach Barpeda Road the world looks very suburbian. There are tuktuk lined up east of the station who probably expect to take people to Manas in January but not so much in November, and I am quite sure I was the only tourist in the park who came by train. The road up north got washed away at one point and is really bumpy and dusty. The driver had no problem with it and was happy to pick me up again the next day. Right, so Manas is actually two parts divided by a political boundary. The Bhutan side, Royal Bhutan NP, sounds better, and should be Bhutan's first WHS right now. It's almost like all the animals ran away up north. I hardly spotted anything on the Indian side. Sure, there was a rhino grazing at the park entrance but those can be found en masse at Kaziranga which ultimately is the better place to go. The park has had troubles in the past but maybe it should be reviewed if there is still enough criteria to keep it on as a WHS. Should the Royal Manas area be included it would maybe make sense again, but until then I can only recommend visiting the north area which for non-Indians is only officially done from Bhutan by a major tour including lengthy road trips. So, at last Manas gets a review on this Web site - but the Fates tried very hard to prevent us from being able to do so! It is situated right on the border with Bhutan about 3 hours west of the major city of Guwahati by rail. The nearest railhead is the modern town of Barpeta Road from where it is another 45 minutes north through country roads to the entrance at Bansbari. Our overnight train from the West chugged into Barpeta Rd some 4 hrs late, so we had already missed our planned afternoon game run, but worse was to come – The PJACBM (People’s Joint Action Committee for Bodoland Movement) had just started a 100 hour “bandh” or strike/lockdown in support of their ongoing demands for greater autonomy from the Indian/Assamese governments and it wasn’t clear if it was possible/safe to try to travel north into Bodo country. Luckily we were able to make some very hurried rearrangements by which we continued to Shillong that day (totalling 62 hours continous travel and 2 overnight trains since we had left the Sundarbans!) by road/rail and returned 2 days later for our full ration of game runs. Well - was it worth all the hassle? It had long been a matter of some surprise to me that in 1985, this park should have been one of the first natural sites inscribed by India. Unlike the other 2 inscribed at the same time (Bharatpur and Kaziranga) Manas doesn’t really figure among the iconic/famous tourist parks of India and there are plenty of other, more famous, ones which could have been chosen. But. of course, UNESCO inscription isn’t (or shouldn’t be) about tourist hotspots but rather about locations of genuine worth. During our trip we met a professional Indian wildlife photographer and he asserted that, back in the early 80’s, Manas was something of a jewel in India’s wildlife crown – a large viable unspoilt Terai forest ecosystem with a wide range of creatures including, in particular a large number of wild Indian elephants and situated on the boundary of Indian and Indo-chinese faunal areas. To be fully “complete” it really needed the inclusion of Bhutan’s contiguous “Royal Manas Park” which provided a corridor for the elephants, but, at that time, Bhutan wasn’t even a signatory of the WH Convention. (It joined in 2001 and the inscription/addition of its “Manas” would seem to be just a matter of time). However, during the 1990s much of this was ruined by the Bodo insurgency. The park had been closed and placed on the danger list. Our hotel had been used by the army fighting the rebels (who were able to use Bhutan as a haven beyond Indian control) and many of the animals – including swamp deer, elephant and rhino had been killed by rebels both for food and for ivory/horn money to fund their activities such that rhino became locally extinct. After failed earlier attempts, an agreement had been reached with the Bodo in 2003 which set up an autonomous administrative unit but, as we had discovered, the situation was still tense with some Bodo still wanting a separate state and others wanting to extend the limits of their autonomy within Assam. Our rearranged schedule gave us the 2 afternoon game runs and the morning elephant ride we had originally planned There are several hotels at the entrance (We used Bansbari Lodge which is supposedly the best – it was ok) and Gypsy (jeeps) are available there to hire with rides lasting 4 -5 hours. If you didn’t want to pay for one of these then an elephant ride would get you into the park as they start just inside the main gate – but, wonderful experience as this is, you will not see that much wildlife from the uncomfortable 3 person howdahs. There is also the problem of getting a “booking” on one. On our morning ride 2 elephants went out, though there are more – ours were accompanied by 2 babies who were clearly delighted to be going for a walk in the forest showing their joy in the way of baby elephants by frolicking and “trunk playing” between “milk top ups” from their mothers who were carrying us! Oh – and “camera fees” for foreign tourists are 500 IR per day. They still have an enormous “”video camera fee” as well but don’t charge it for modern digital still cameras with a video facility. In the afternoon we went further into the park and had good views of birds and wild buffalo/elephant. The latter provided a particularly memorable experience as we were charged at by a group (despite keeping a good distance from the herd of mothers and babies). As our jeep reversed at great speed, hardly staying on the road, our wildlife guard from the Forest Department (compulsory) fired his gun in the air as a warning shot!! In the early evening at Mathanguri we looked across the Manas river to the hills of Bhutan and saw the armed protection patrols setting out – an experience to be given more meaning by event a couple of days later in Kaziranga (see my review). A dusk/night drive is allowed back from Mathanguri to Bansbari but, whilst nice, it didn’t come up with any great animal encounter. 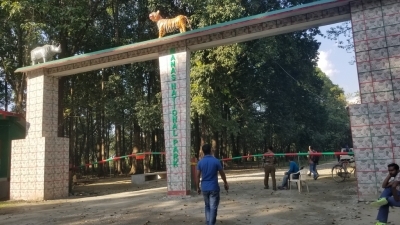 Apparently it is also possible to stay inside the reserve at Mathanguri – but you would have to be fully self sufficient regarding food and since, as far as I am aware, you need a jeep to enter the park that would cost more too if kept all day/night – also it has a reputation for VIPS bouncing everyone else, a common event in India which can happen re elephant ride bookings also! During the afternoon we also saw some of the re-introduced Rhino. Tiger are present but we had no expectation of seeing any and didn’t, beyond and few pug marks in the sand! Indeed our wildlife guide (another “cost” but well worth having on the jeep!) had managed just 7 “glimpses” in the 4 month season from November during which he had probably had 200 trips into the park! We didn’t see any of the less iconic specialities such as Hispid Hare or Golden Langur. In summary, we enjoyed our visit to Manas – it was pleasantly undeveloped and, during our game runs, we hardly saw another jeep – unlike in the central area of Kaziranga. But you won’t see large number of animals and the views we got in Kaziranga were better - I certainly wouldn’t take it in as an alternative to there. Birds are far more numerous but, even there, I wouldn’t put it above Kaziranga. Royal Hunting Grounds: The area was initially the hunting grounds of the Maharaja of Cooch Behar and the Raja of Gauripur. It was declared a protected area - Manas Sanctuary, as early as 1928, but the hunting rights of the royal families were not revoked. The sanctuary finally turned fully protected when it became a Tiger Reserve in 1973, and a national park in 1990. Holocene: The course of the Manas river formed in the Holocene and continued to change as late as the 20th century. Potential Transboundary sites: Bhutan's "Royal Manas NP"
Extensions on Tentative List: Bhutan's "Royal Manas NP"